Those of you who know me well will know that I love my bed. Seriously, for me, sleeping could be considered a hobby. I am the least morningy person you’ve ever met, and generally need a good eight hours sleep and two cups of tea before I’m even vaguely conscious in the mornings. So what, in the name of all that is holy could possibly prompt me to get out of bed at 5:30am on a normal working day? 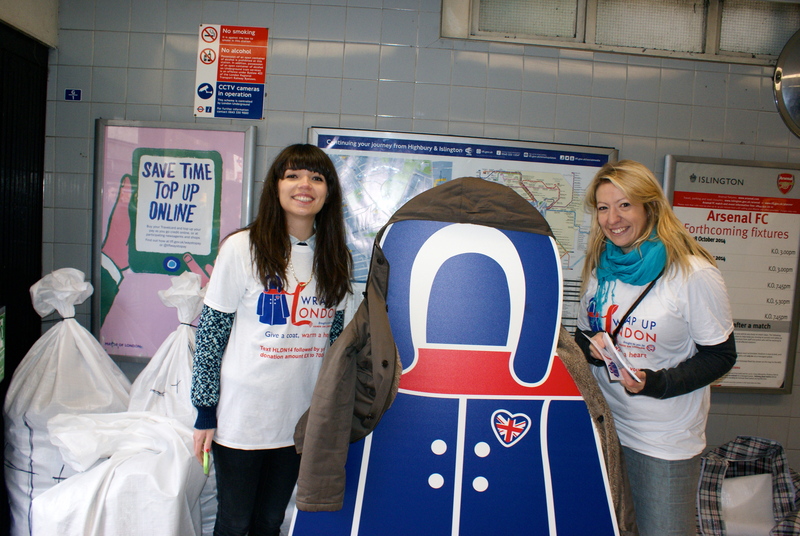 This week is Wrap Up London, an amazing event run by Hands On London, where coats and jackets will be collected at tube stations all across the city and donated to people in need. After my recent experience with one of London’s homeless people, you better believe this would get me up at 5:30am. A Wrap Up London volunteer braves the commuter crowds. 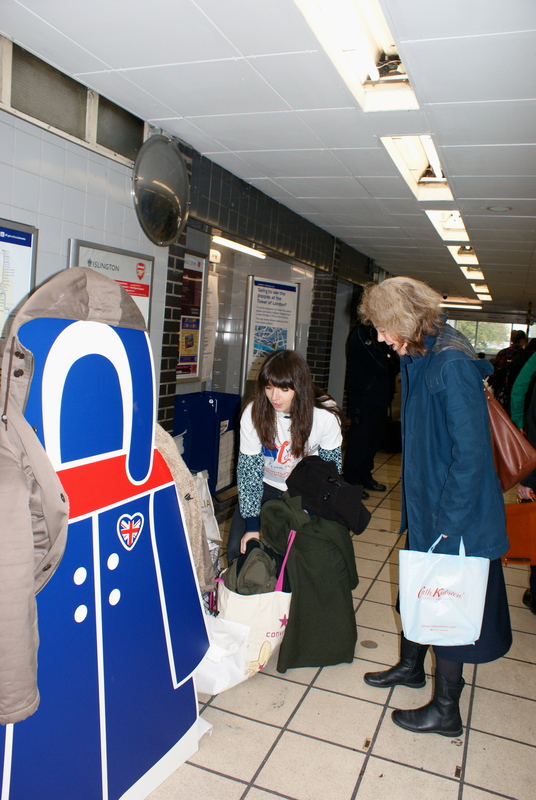 The campaign doesn’t collect money at the tube stations, they just take those old coats that are gathering dust at the back of your wardrobe and give them to someone who might get cold this winter – whether they are homeless, women fleeing abuse, victims of trafficking or suffering from fuel poverty. A simple, but beautiful idea. I caught up with Volunteer Coordinator, Alice to chat about the campaign.Alice has been part of the Wrap Up London campaign since it began four years ago, joining as a lowly intern and staying part of it ever since! The great thing about Wrap Up London, she says, is that it’s a charity with such an immediate, tangible benefit. Wrap Up London volunteers are collecting coats that the owners no longer need or want and giving them directly to the people who need them. Every single coat donated means that one more person stays warm this winter. She’s right. That’s amazing. For the record, last year’s campaign collected just under 17,000 coats. Team leader Louise bags up one of many generous donations. I ask her about her most inspiring Wrap Up London moments, and I challenge your heart not to warm at them. She told stories of people collecting coats from their whole streets and driving them to collection points. Others collected in their work and showed up with entire shopping trolleys bursting with coats. But her favourite story was that of a man who walked past the collection point, backpedaled, took off his coat and handed it to the volunteers, saying, “I need to buy a new one anyway”. Upon seeing this, the man behind him remarked that this was a great idea and proceeded to do exactly the same. For a city with a reputation for being cold-hearted, London, I am damn proud of you. 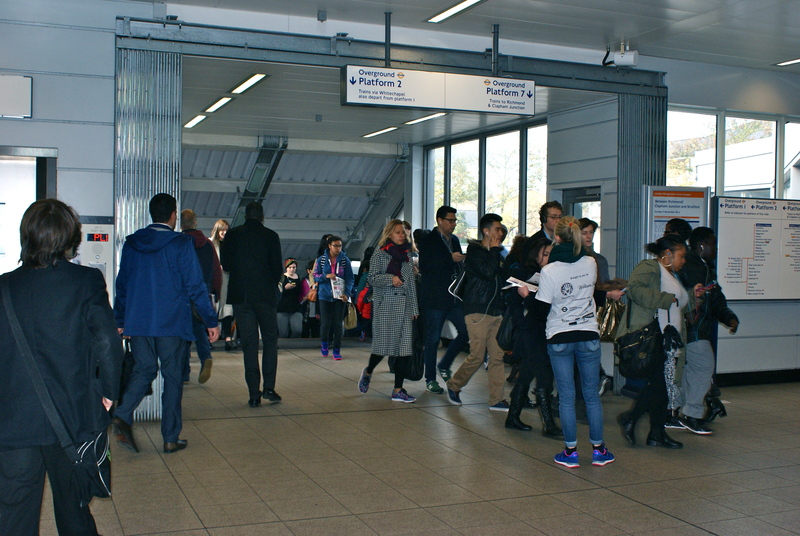 There are collection stations all over London this week, running from 7am until 11am, Wednesday – Friday. If you have an old coat that you’ve been meaning to get rid of, please do consider donating it to this amazing cause. Drop it off on your commute, get your good deed done before 9am, feel awesome all day and help someone get through the winter. This photo was taken at 8:30. Look at the bags already full behind them. For more information on Wrap Up London collections, click here! 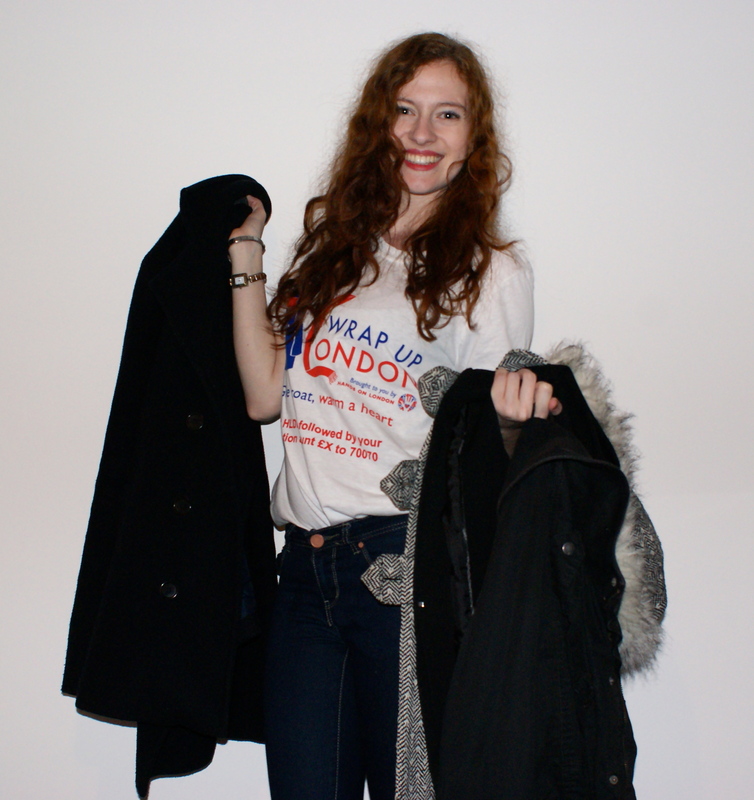 You can also follow Hands On London on Twitter, and get involved with the campaign using the hashtag #WrapUpLondon. Give a coat. Warm a heart.